Frances Iverson, age 87, of Willmar, died Thursday, March 21, at Banner Boswell Medical Center in Sun City, Arizona. Mass of Christian Burial will be 12 p.m. Saturday, April 6, at the Church of St. Mary in Willmar. Interment will be at St. Mary’s Catholic Cemetery in Bird Island at a later date. Visitation will be 5-7 p.m. Friday, April 5, at Peterson Brothers Funeral Home in Willmar with a prayer service at 4:30 p.m. and a rosary service at 7 p.m. Visitation will continue one hour prior to the service at the church. Memorials are preferred to the Church of St. Mary or the Bird Island American Legion Auxiliary. In honor of Fran, her family asks that you please wear her favorite color red. Frances Gertrude Iverson was born January 5, 1932, in Bird Island, Minnesota, the daughter of Frank and Viola (Forcier) Meyer. She grew up in Bird Island and graduated from St. Mary’s Catholic School in Bird Island in 1949. She worked for Ringness Drug Store and Northwestern Telephone Company in Bird Island. On May 23, 1952, she married William Iverson, Jr. and they made their home in Willmar. Fran worked at the Willmar Junior High School and as an insurance representative at ACMC Health. She also spent many years at Rice Hospital as a volunteer at the information desk or assisting with insurance claims for patients. 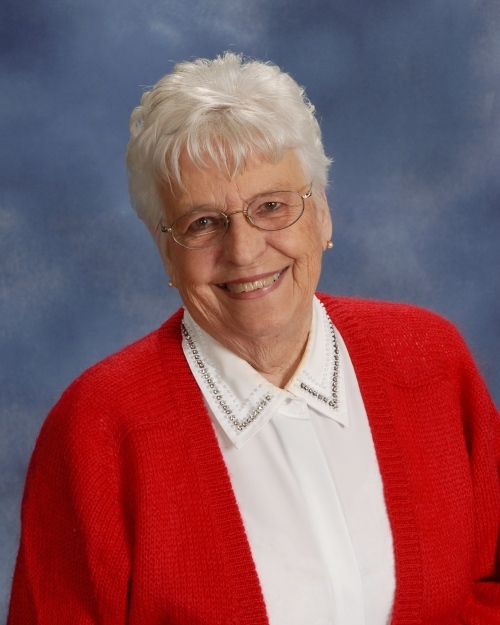 Fran was an active member of the Church of St. Mary in Willmar, volunteering for rummage sales, funeral lunches, craft sales and any other church function where help was needed. She was an excellent seamstress and knitter and donated many newborn caps to Rice Memorial Hospital and helmet liners for the troops. She enjoyed traveling, golfing, and meeting friends for coffee. Her greatest love was her family, especially her grandchildren and great-grandchildren. Fran had a giving and generous heart and was affectionately known as Grandma Fran or Granny Franny to not only her grandchildren but to many others as well. She is survived by her children: Steve (and Peggy) Iverson of Willmar, Barb (and George) Iverson-Roesler of St. Paul, and Bill Iverson (and Pam Mayer) of Willmar; her grandchildren: Chris, Megan Roesler, Becky Iverson (and Taylor Gilb), Briana (and Ross) Skowronek, Carlee (and Lee) Ashburn, Joe Iverson (and fiancée Taylor Flegel), John Mayer, and Sheila Mayer; her great-grandchildren: Mason, Connor, Greta, Mabel, Bristol, Abe, Shawna, and Sadie; a sister: Marie Meyer of Bird Island; her niece/goddaughter: MaryJo Mattson of Danube; and other relatives and friends. She was preceded in death by her parents; two brothers: Donald and Art; her former husband: William; a grandson: Mike Mayer; a nephew: Allen Meyer; and her special friend: Oliver Riedel. Although everyone appreciated the things she did for them, our hope is that she understood the impact she made in so many lives.